We’d love your help. Let us know what’s wrong with this preview of Plant Families by Ross Bayton. Most of us lump plants together in one big family, and when pressed can only explain their grouping by what they’re not—not an animal, not a mineral, and so just a plant. In reality, there are hundreds of different plant families, each grouped logically by a unique family history and genealogy. This brings sense and order to the more than a quarter of a million different p Most of us lump plants together in one big family, and when pressed can only explain their grouping by what they’re not—not an animal, not a mineral, and so just a plant. In reality, there are hundreds of different plant families, each grouped logically by a unique family history and genealogy. This brings sense and order to the more than a quarter of a million different plant species covering a diverse spectrum that includes soaring sequoias (Cupressaceae), squat prickly pear (Cactaceae), and luxuriant roses (Rosaceae). Plant Families is an easy-to-use, beautifully illustrated guide to the more than one hundred core plant families every horticulturist, gardener, or budding botanist needs to know. It introduces the basics of plant genealogy and teaches readers how to identify and understand the different structures of flowers, trees, herbs, shrubs, and bulbs. It then walks through each family, explaining its origins and range, and describing characteristics such as size, flowers, and seeds. Each family is accompanied by full-color botanical illustrations and diagrams. “Uses For” boxes planted throughout the book provide practical gardening tips related to each family. To ask other readers questions about Plant Families, please sign up. I came upon this book by chance. I was just leaving the library when I noticed Plant Families on display, and it jumped out at me. (I mean visually - it didn't leap off the shelf.) I looked at a couple pages, and it was so captivating, I had to go back to the counter and check it out. The cover is beautiful, the inside cover likewise. The pages are beautifully illustrated and perfectly arranged. The paper itself is of superior quality and so lovely to touch, and a vivid red silky ribbon bookmark I came upon this book by chance. I was just leaving the library when I noticed Plant Families on display, and it jumped out at me. (I mean visually - it didn't leap off the shelf.) I looked at a couple pages, and it was so captivating, I had to go back to the counter and check it out. The cover is beautiful, the inside cover likewise. The pages are beautifully illustrated and perfectly arranged. The paper itself is of superior quality and so lovely to touch, and a vivid red silky ribbon bookmark completes it. The entire thing is a work of art. If you ever have an opportunity to browse through this book in person, I highly recommend it, for its artistic merits alone. I have seen some reviews point out that this book is more geared towards Europe, and is a bit lacking with respect to North American species. I am not knowledgeable enough to judge the accuracy of this claim, and I would assume that gardeners know what they're talking about, but I found that the book talked about plants across ALL continents, with North America getting as much attention as the rest. It may be that people are objecting to the fact that this book talks mainly about plant families, and only lists individual species as examples of what belongs in a plant family - but the examples seem to be about an equal mix from all continents (I've looked up a lot of them, and they are from all over). Anyway, the purpose of this book is not to be a comprehensive encyclopedia of each individual species of plant. 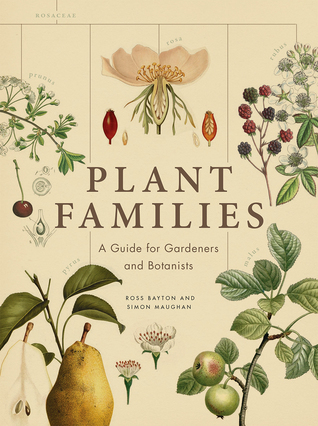 What it was meant to do - and does very well, in my opinion - is to clearly delineate plant families, and provide easy-to-understand explanations (with very helpful illustrations) of how to recognize plants as members of various families. It also talks a little bit about the needs of various types of plants, and what is suitable to grow in what kind of environment, but again, it doesn't go into great detail, since that's outside the scope of the book. I received this book through a giveaway from Goodreads. First let me say that when I opened the envelope I caught my breath ... the book itself it beautiful! The cover has a fabulous texture and the colors and pictures are very special - like a piece of artwork. The inside covers are beautifully lined up at the corners and the lining is placed with care with it's rich color and patterns. Each page is a joy to turn and to feel the texture of. The page marker is a beautiful ribbon whose color goes I received this book through a giveaway from Goodreads. First let me say that when I opened the envelope I caught my breath ... the book itself it beautiful! The cover has a fabulous texture and the colors and pictures are very special - like a piece of artwork. The inside covers are beautifully lined up at the corners and the lining is placed with care with it's rich color and patterns. Each page is a joy to turn and to feel the texture of. The page marker is a beautiful ribbon whose color goes so beautifully with each page of the book. The book itself has so much wonderful information about the different plant families. It's a great reference that will hold a special place along with our other gardening books. As with the others in this series, this is a beautifully laid out and illustrated book. Lots of information that will be useful for the continued future.